By activating this option, a single click on the selected cell is sufficient to enter in the modification mode. If the function is not activated, you have to double-click on the cell in order to enter in the modification mode. By activating this option, the program automatically selects the first draft text in the drop down list and automatically fills it in the row where you are. By activating this option, the program will add up the selected amounts. Deactivate this function if this instantaneous addition slows certain operations down. One can select non-adjacent amounts by holding down the Ctrl key while selecting individual cells with the left mouse button. By activating this option, the cursor will place itself on the next row when pressing the Enter key. Insert the maximum number of undo operations (one at a time) when using the Undo command from the Edit menu. When inserting data, the program reads the data that has already been entered and tries to suggest how to complete an entry. In cases where there are many rows, this function could slow down the process. 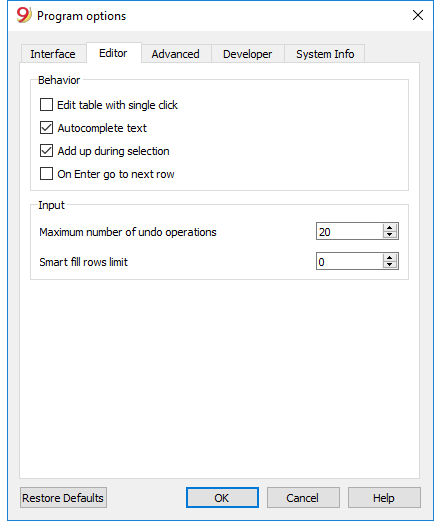 The user can define a limit for the number of rows, above which the smart fill will not be used. If there is no value entered or zero, smart fill will always be used.